At CCTV Camera Pros, customers often ask us what the angle of view looks like with different security camera lenses. When planning a video surveillance system, the angle of view that a camera lens provides is important to understand. Lens size is the main factor that determines the angle of view (zoom level), however, it is not the only factor. The size of the image sensor on the camera’s circuit board also influences the angle of view (but not nearly as much as the lens size). 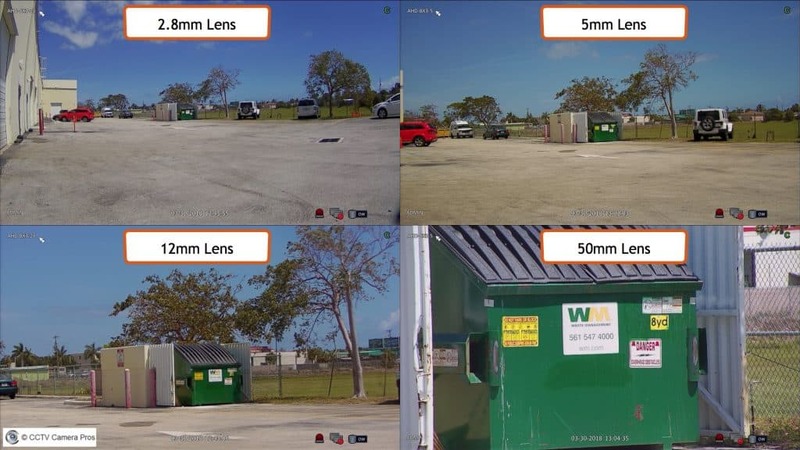 This article will compare a few of the most common lens sizes used on the latest HD security cameras (HD-TVI, AHD, HDCVI). This is the security camera that was used to capture the four images in this article. It is a box-style 1080p AHD camera with a vari-focal lens (adjustable lens). Actually, two vari-focal lens options are available on this camera: a 2.8 to 12mm and a 5 to 50mm. This camera has a 1/3 inch image sensor which is very common. More about the impacts of image sensor size will be explained later. 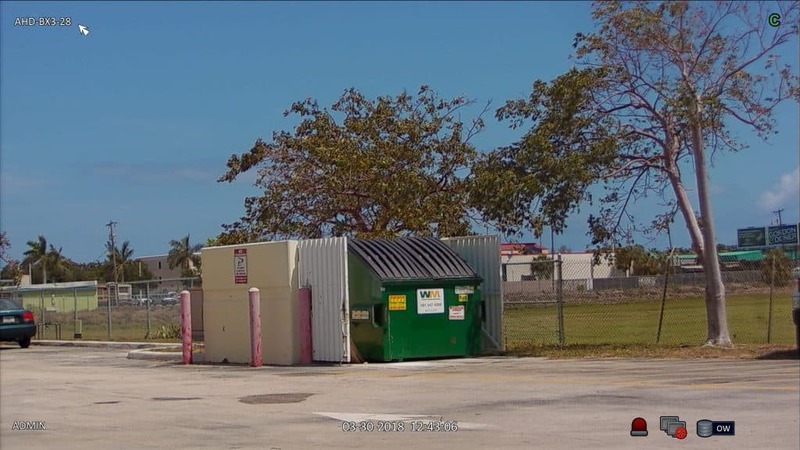 To capture the below images, the AHD-BX3 camera was installed at CCTV Camera Pros warehouse and pointed at a garbage dumpster that is 90 feet away from where the camera is mounted. The camera was connected to this iDVR-PRO surveillance DVR using HD over coax compatible security camera cables. This is a standard setup for video over coax / CCTV type systems. 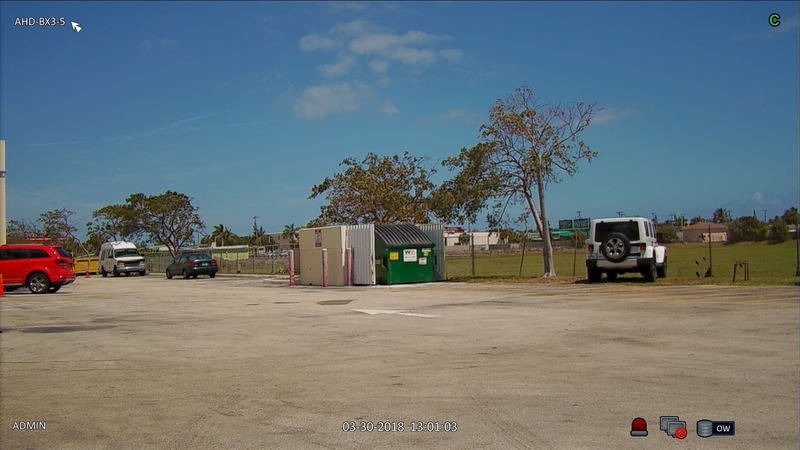 Please note that the camera was mounted in the same location to capture all of the below surveillance images. The angle of view / zoom level was adjusted ONLY by the lens setting. The above image shows the angle of view using a 2.8mm lens. I adjusted the 2.8-12mm lens to the widest position to capture this image. A 109 degree horizontal view is captured. Here is the 2.8-12mm lens adjusted to the most narrow / zoomed-in setting: 12mm. At 12mm, the camera captures approximately a 22 degree horizontal field of view. For this image and the next one, the AHD-BX3-5 with 5-50mm varifocal lens was used. This first image was captured with the lens set at the widest setting – 5mm. At the 5mm lens setting, an approximate 50 degree field of view is captured. 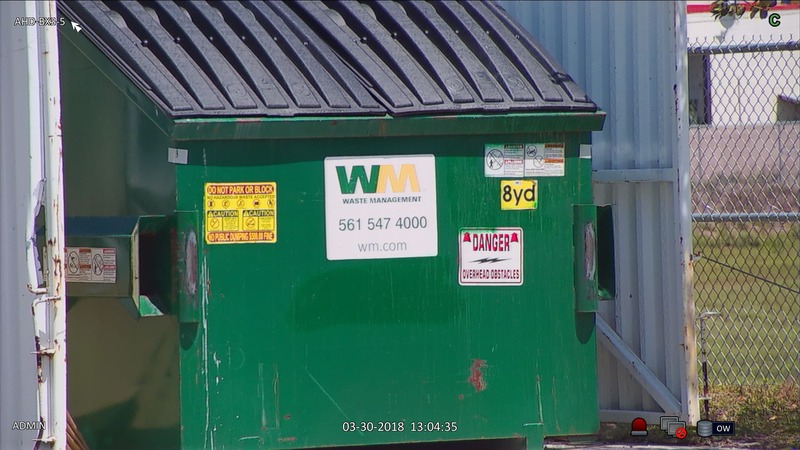 At 50mm, the camera captures only a 5.5 degree field of view but allows the camera to clearly capture the text and details of the dumpster as if it was right in front of the camera (instead of 90 feet away). A security camera’s image sensor is the electronic component on the circuit board of the camera that actually captures the image from the lens. Image sensor sizes vary. 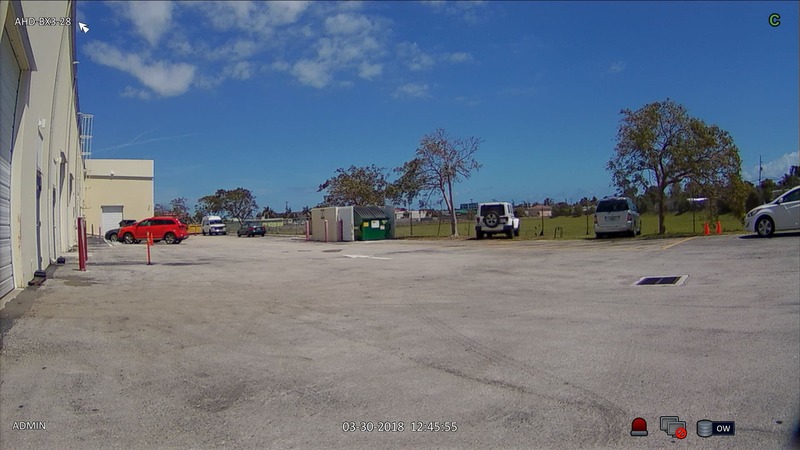 The camera that I used to capture the above images has a 1/3″ image sensor which is the most common size among HD security cameras and traditional analog CCTV cameras. The following sizes also exist: 1/2.7″, 1/2.8″, 1/2.9″. These are slightly bigger than 1/3″ which provides more surface area to capture the image. This can make the angle of view slightly wider. For example, a 2.8mm lens on a 1/2.7″ sensor captures a 114 degree field of view, compared to the 109 degrees captured by the 1/3″ sensor. The difference is not great, but worth noting. If you have any questions or need further help in any way, please contact me at mike@cctvcamerapros.net. If you would like to see more examples, all of our camera pages have sample images and videos. Our AHD security camera page is a great place to start. You can find a bunch of video demos of security cameras and video surveillance equipment on our YouTube channel.